Christian Fundamentalist Terrorist? So Says NYT! Be prepared for liberal media assault: “Norway slaughter now proves Christians can be terrorists just like Muslims.” Search the web and the real news and you find him claiming to be an ideological right-winger politically — opposed to multiculturalism and Islam, but where does the liberal media prove that he claims to be a Christian? 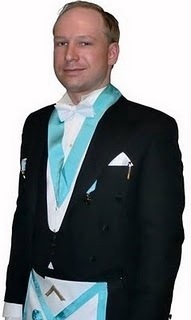 Seems Anders Breivik was a right-wing political nut, and a Mason, not a professed Christian. The Catholic Church has declared the Masonry in an excommunicatable offense. Many denominations denounce it as non-Christian. Catholic Answers has an excellent article here: http://www.ewtn.com/librar? y/answers/camason1.htm. Masonry is a parallel religion with its own theology, altars, prayer, worship, etc. Historically, one of Masonry’s primary objectives has been the destruction of the Catholic Church; this is especially true of Freemasonry as it has existed in certain European countries. If one can find proof he is a self-professed Christian and did this due to his “Christian faith,” please let me know. Christians flee from any sort of association with such carnage, sickness and insanity. But isn’t it interesting that a Muslim group associated with al-Qaeda claimed responsibility before later retracting it and also (here).